Located in Green City of Gandhinagar, Capital of Gujarat, INDIA; SUVIK is spread over 8000 sq.mtrs. land having full-fledged manufacturing and customer support facility. The strategic manufacturing location is fully equipped with state of art infrastructure for R & D, Production, Testing & Quality Assurance. The customer orders are transferred into manufacturing documents through established engineering systems with the help of CAD system. Controlled systems of materials management through ERP systems allow qualified purchasing activity from approved vendors. A quality control and inspection system operating under ISO 9001:2008 quality system to help zero defect manufacturing. A well established test and manufacturing facility, fully equipped with customized modular test setup along with load test setup, allows a smooth flow of quality products through the customer audit. The testimonials are mega-power range of stabilizers, import substitution of customized power supply systems, Telecom Integrated Power Units the most significant mile stone of Suvik D&D. DSIR (Department of Scientific & Industrial Research) approved in-house R&D. 1200 sq mtrs of development working space with Electronics lab, Power test lab & R&D prototype test facility room equipped with sophisticated development systems. Use of simulation softwares like PSIM, MATLAB for industrial electronics applications. Development tools like Code Composer Studio, Development Kits for Digital Signal Processor (DSP) and Micro-controller. In-house design of electronics circuits using PCB Design software like PROTEL. In-house design and development of enclosures using Auto-cad. Skilled man-power with excellent academic knowledge in power electronics industry. 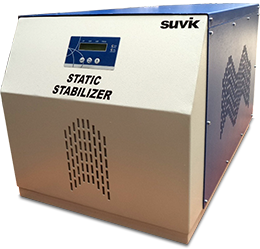 Suvik Electronics with its large manufacturing plant fully equipped with state of art facilities is poised for standard as well as customized industrial systems based on latest power electronics technology. The manufacturing setup is equipped with state of art production tools and infrastructure followed by world class test setup housed in safe working environment. Suvik has employed highly qualified and skilled staff to carry out manufacturing operations. The work-force is well experienced on the latest production facilities equipped with state of art tools & tackles. The test facilities are laid down in line with general engineering norms as well as comply to electrical, electronics quality standards. The test house consists of functional as well as type tests as per international test standards. The sophisticated test equipments and measuring equipments ensures compliance to technical specifications. The total production & testing infrastructure is fully geared up even to undertake contract manufacturing of similar allied industrial electronic products. The QA system is designed to meet the quality objectives defined in quality policy. QA activity involves maintenance and upgradation of quality system as per the need. QC is an important sub element of QA structure involved in day to day quality functions. The sub functional elements of QC are incoming inspection, in-process inspection and finished goods inspection. This quality control infrastructure ensures the compliance from drawing board to delivery in meeting customer’s requirement. The quality assurance group ensures system implementation with regard to customer satisfaction. QA helps third party quality audit of products to enhance AQL. QA infrastructure is fully equipped with information on qualification test internal and external as well as certification. Mission Critical Equipments Manager in 24/7 Environment. SUVIK leads the customer service revolution with latest initiative of true online customer support. With a well established all India level service network supported by regional trained service professionals along with availability of spares allow SUVIK to give personalized customer attention keeping MTTR to lowest. Portfolio of quality of services range from pre-sales to post-sales : covering application engineering, system design, on site technical support, on site training to customers, classroom training at works etc.